The title should actually be Maesbury to Grindley Brook via the Prees Branch and the Whitchurch Arm! 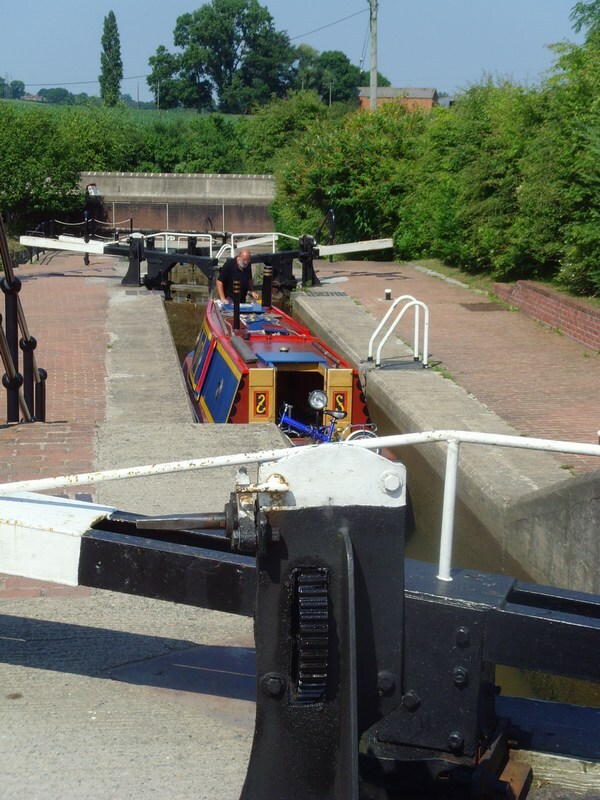 Today saw a leisurely start soon after 8.30am as we could not start the ascent of Frankton Locks until about 12 noon when they were due to open. 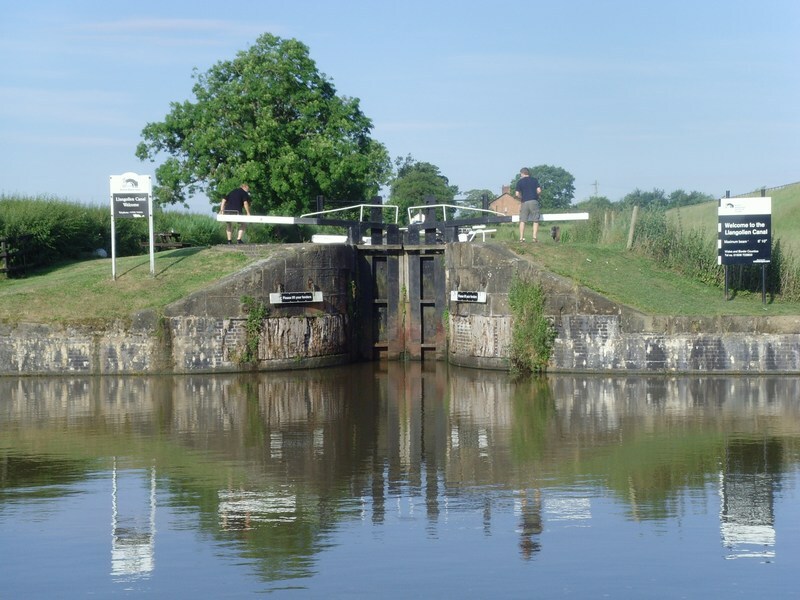 The three locks at Aston were soon climbed and we made steady progress through Graham Palmer lock to the foot of Frankton locks, arriving soon after 11.30 to find that there were already boats coming down the flight. There was a queue of boats waiting to ascend and we were fifth in line. Progress was slow but steady towards the bottom lock due to the number of boats coming down. Whilst drinking a beer our turn eventually came and we cleared the top lock soon after 2.00pm and we soon rounded the junction and headed towards Hurleston. Lunch was quickly prepared and consumed on the move. 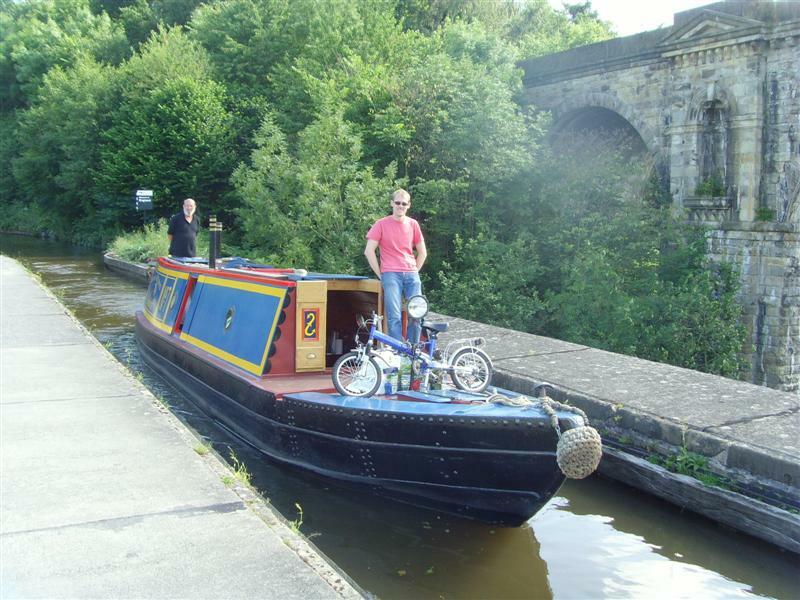 Robert cycled into Ellesmere to purchase provisions and rejoined us just before the Ellesmere tunnel. By this time it was raining quite hard and an umbrella was the order of the day for the steerer. We headed for the Prees branch. Most of the picturesque lift bridges have been converted to hydraulic operation but here we encountered our first manually operated lift bridge (pull the chain and hope you are heavy enough to operate the bridge!). At the end of the arm we turned in the entrance to the large marina that now occupies the old clay pits that once provided the puddling for the local canals. The delay at Frankton meant we were behind schedule, but still we pressed on making the short venture down the Whitchurch Arm and finally mooring at the top of the Grindley Brook flight of locks at 9.20pm after some comfortable cruising with the flow. At that time of day there are fewer boats on the move so it’s less likely we’ll meet a boat in a bridge hole. After the afternoon showers the setting sun finally appeared for an orange sunset before we sat down for dinner which was mostly prepared underway. Bernard has calculated the stats for our first milestone: Heyford to Trevor (including the Ellesmere Arm) is 209 miles and 113 locks. Today’s menu: fried egg and sauteed potato sandwiches or toast and jam; tuna salad; bangers and mash with olive and basil gravy followed by cheese. A comparatively late start today in order to catch up on some sleep. 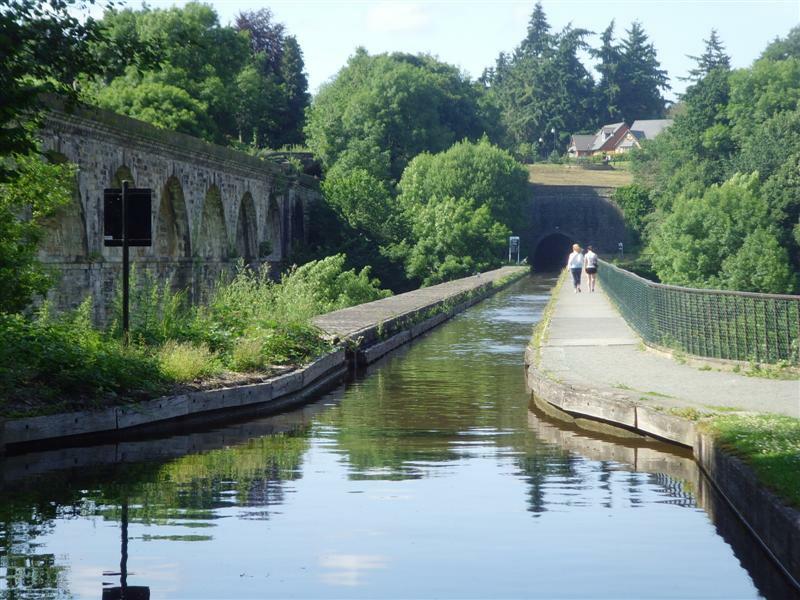 Chirk tunnel was occupied by a boat coming in the opposite direction but soon cleared and we were away at 9.30. 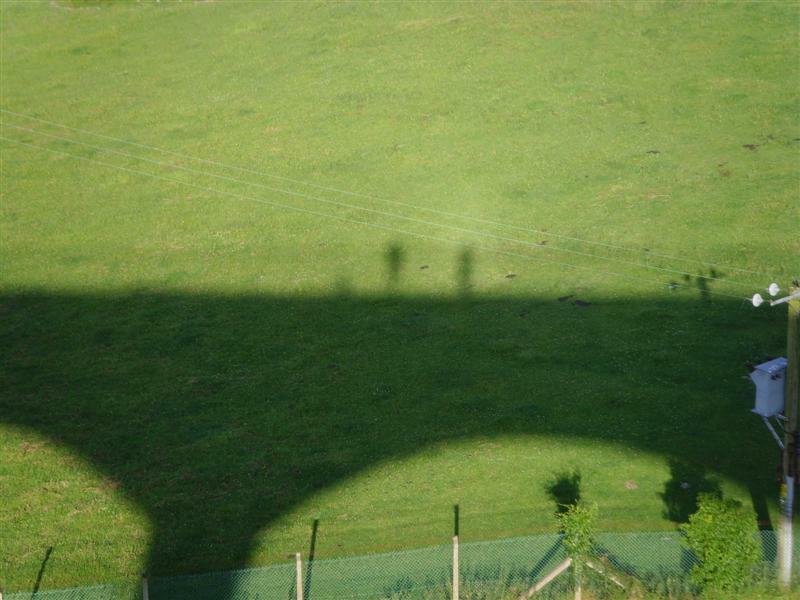 Weather was not so hot and sunny, and there was a light breeze across the aqueduct. Lots of moving hire boats seemed to panic on sighting us. Collisions were mainly avoided and a number of boats passed on the wrong side. Robert practised steering. 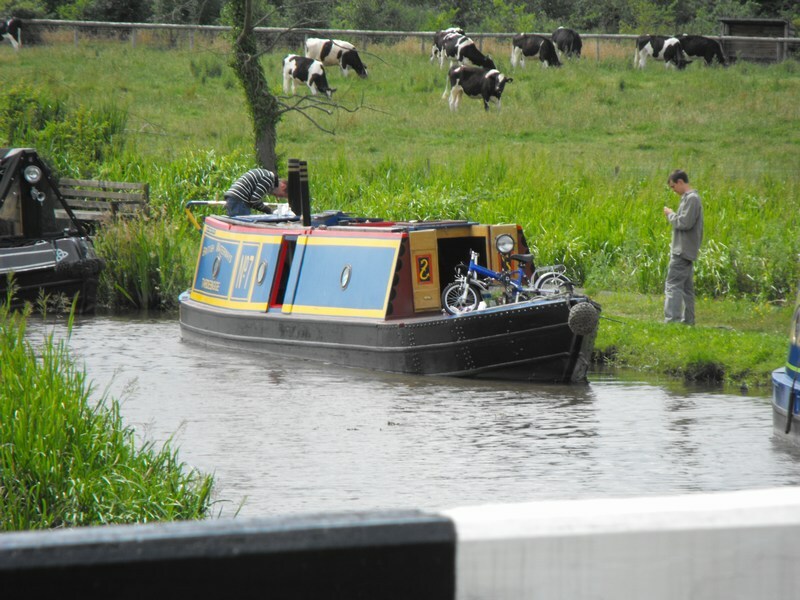 After a shower we reached New Marton locks and copious photographs were taken by Roger from the house by the top lock. His generous wife gave us a packet of chocolate hobnobs (now consumed). 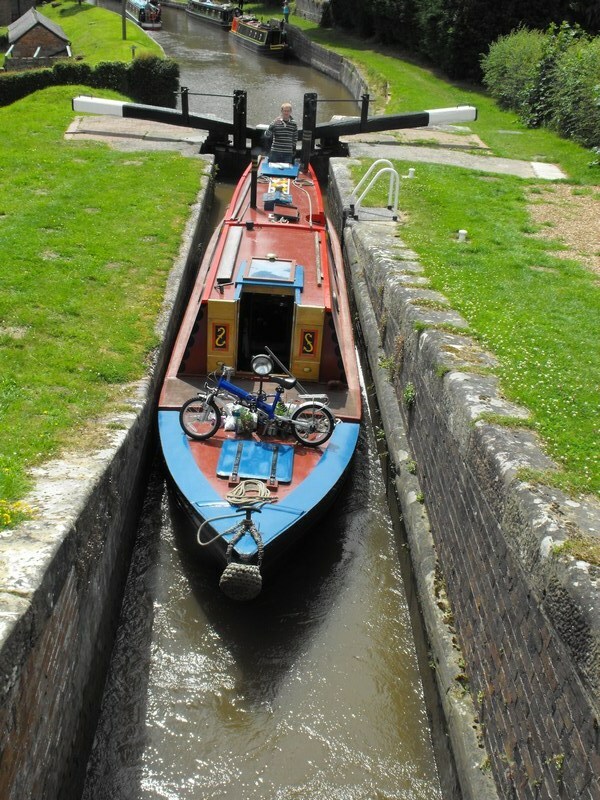 We’d booked passage through Frankton locks a few days before and were greeted by the friendly lockkeeper. We were the last boat of the day and quickly passed through the staircase pair and two further locks before taking water and emptying the loo on the Weston Arm. 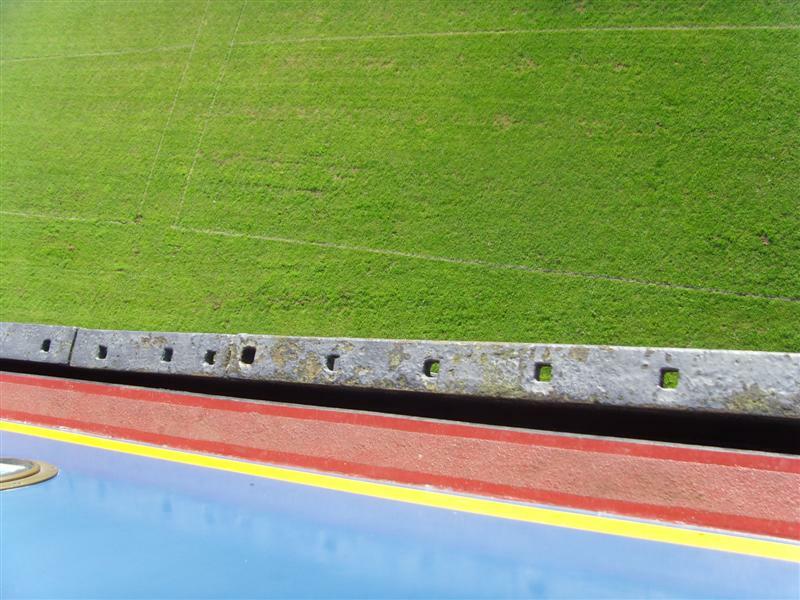 The Graham Palmer lock looked not quite full but on further investigation was empty because the drop was so small. 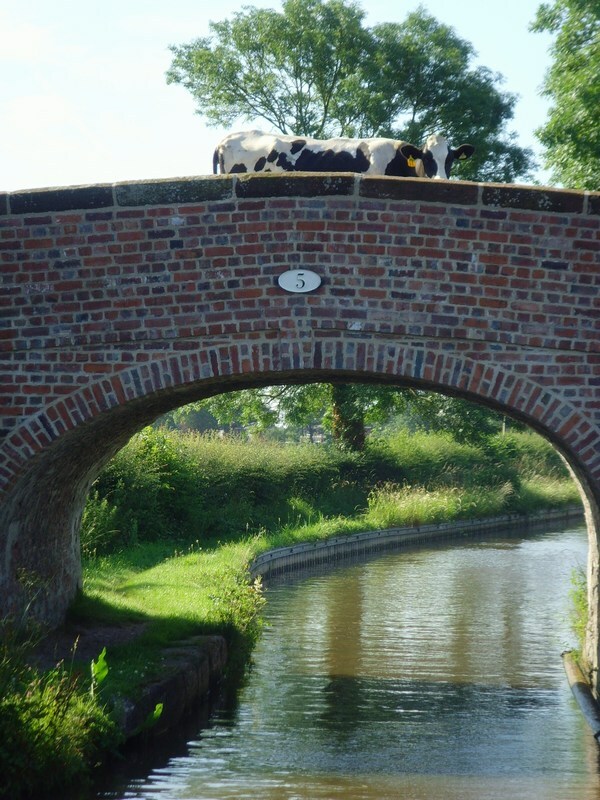 The Montgomery is a beautiful rural canal, if a bit too shallow in places for Tardebigge. We pressed on down to the end at Gronwen Wharf, turned and returned to Maesbury Wharf just in time for three rounds in 15 minutes from the excellent Navigation Inn (telephone 01691 672958). The landlord is very friendly. Breakfast: the usual; lunch was gammon salad and dinner will be beef in red wine à la Bernard. This morning started at 8am when we cast off from our moorings. Overnight it rained very hard but Michael slept through. The morning started overcast then it rained a little – then it rained a lot. Michael was steering but Bernard and Simon had enough good sense to let him get on with it until we hit our first submerged object. A passing dog walker (and ex-boat owner) kindly pulled the bows to the bank and with three people pulling and a lot of rolling and shunting we eventually came free. As we passed the junction with the Montgomery canal Michael attempted to book passage for Sunday but we were so far from any centre of habitation that only emergency calls were available. A suitable connection was made later and our boat name and registration number were recorded by BW. A comment on the blog from Colin Parker had recommended the Jack Mytton pub and rather fortuitously we arrived at lunchtime just as the sun appeared for the first time today. Beer onboard with a salad lunch was quickly followed by more beer and we set off for our final two locks before wending our way to Chirk. The sun stayed with us for the rest of the day and cheered us on our way. 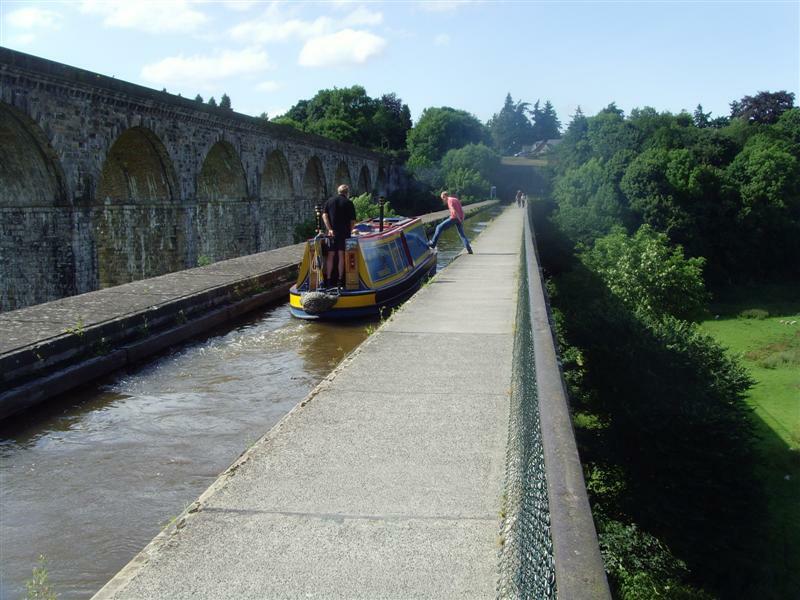 Crossing Chirk aqueduct was very slow as we had to travel against the water flow and the trough is only about 10 inches wider than the boat. 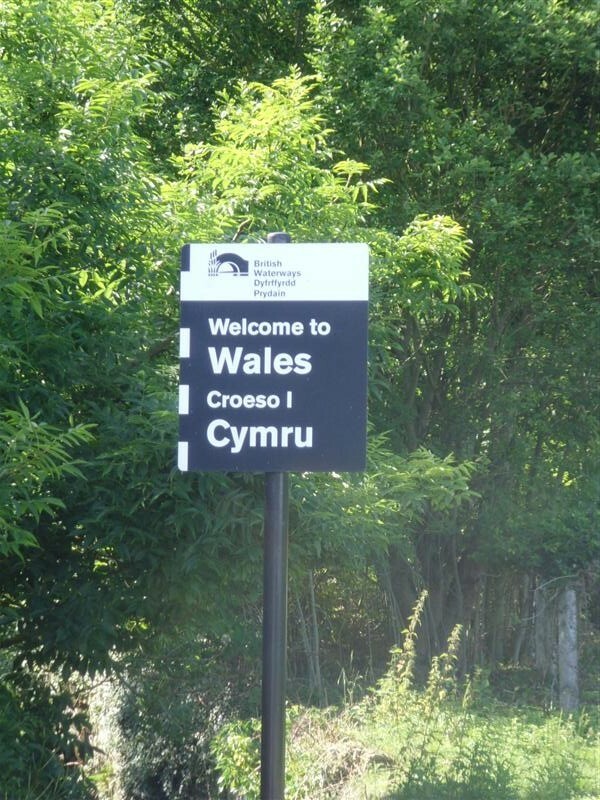 Chirk tunnel was equally as difficult and we were slowed to much less than walking pace. Soon after this we encountered our second major obstacle in the middle of a wider section of canal and we had to do a bit of “rock ‘n roll” to free ourselves. 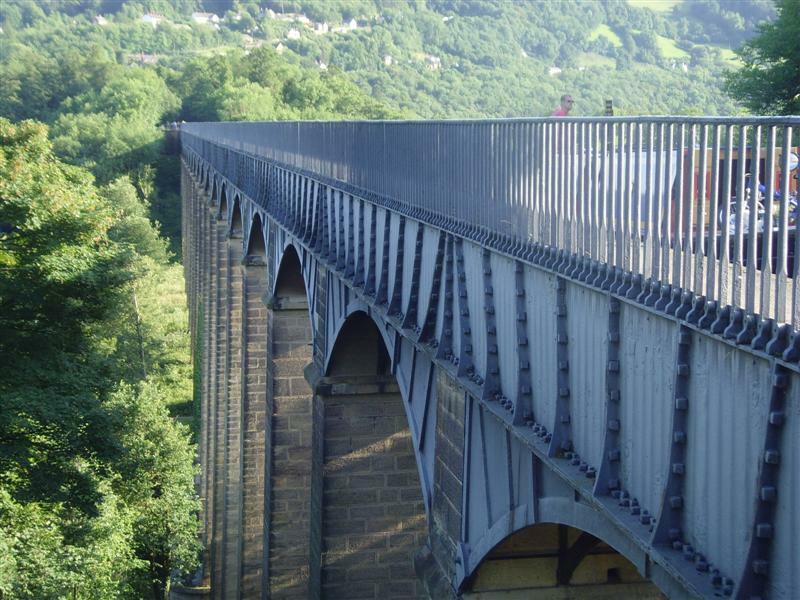 Pontcysyllte was reached and crossed in fine style with lots of photographs. 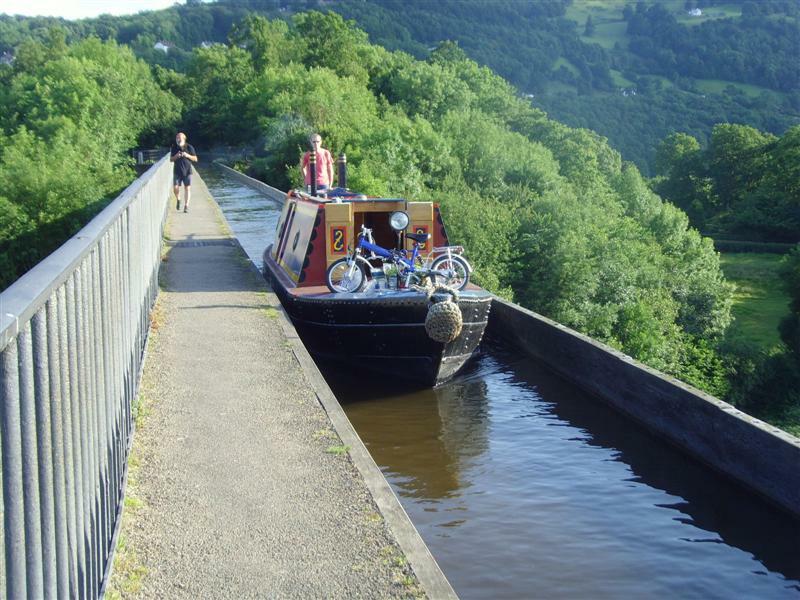 We had already decided against attempting to reach Llangollen due to the limited depth of water that is available. 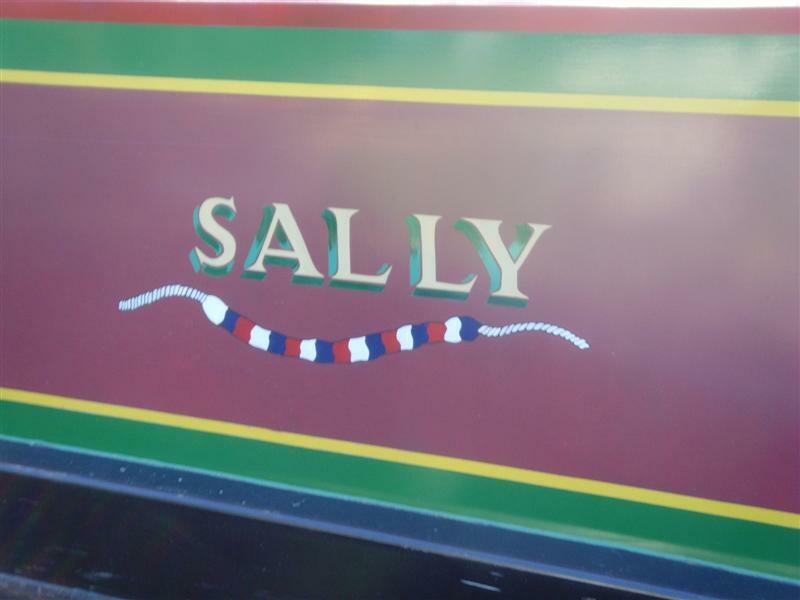 Instead we nosed our way though the boatyard and turned at the end of the arm, just past Peter Furniss‘s boat, Sally (with suitable embellishment). 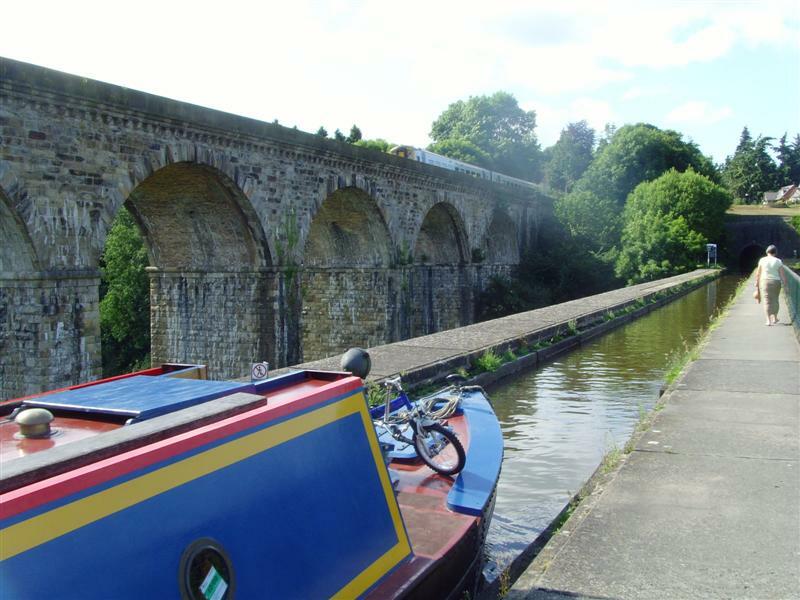 This completed the first leg of the epic journey and we made our way back to the northern end of Chirk tunnel to our selected overnight mooring. Downstream speed is much improved over upstream. Today’s menus: breakfasty sandwiches, pork pie and salad for lunch, meatballs in a cheese and tomato sauce with pasta for dinner. Early start tomorrow. No time to do photos unfortunately. They will probably be added some time on Sunday. The morning broke somewhat cooler than yesterday. It was hoped that this would be a good indicator for the day but it soon warmed up again. 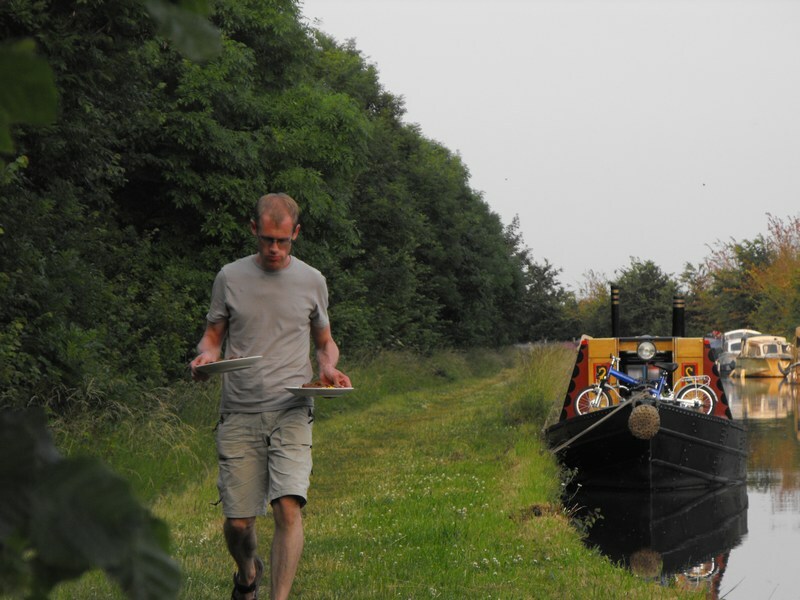 Almost as soon as we left this morning (after Luke had been back to rescue an abandoned mooring stake) we turned off the Shropshire Union onto the Llangollen Canal. 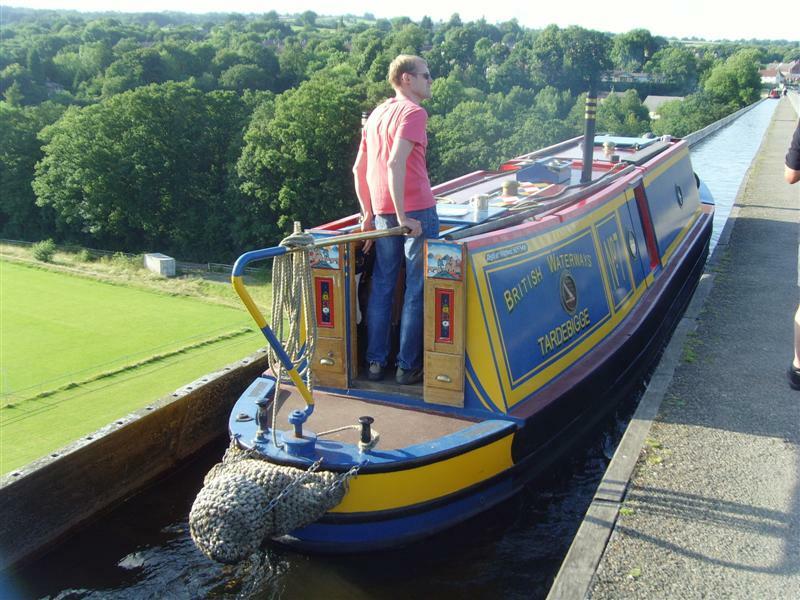 Michael was given the task of squeezing the boat through the four locks at Hurleston as they allowed only fractions of an inch on either side. Shortly after Hurleston we reached Swanley Marina – not shown in the Nicholson guide – where Bernard charmed the ladies at the shop allowing us to pick up a replacement bottle of gas. The increasingly inaccurate Nicholson guide suggested there were “excellent stores” in Ravensmoor. This is some way from the canal but there being a number of locks for the boat to navigate so it was decided that I should have another excursion on the bike. Much further this time and no shop to be found. Dodging milk tankers on a small road with an even smaller bike was something not to be repeated too often. 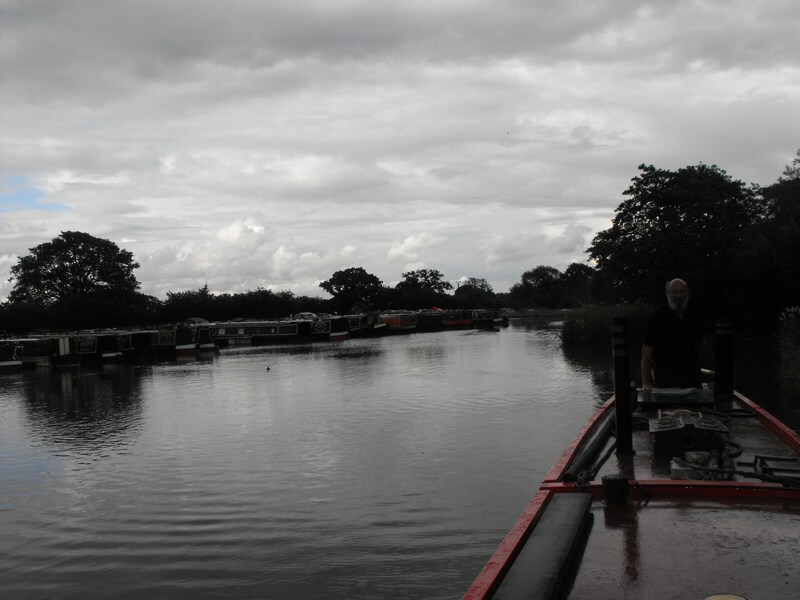 After the locks by Ravensmoor we reached Wrenbury where Luke was to depart the boat. Setting off with his duvet under his arm we said our goodbyes. I disappeared off into Wrenbury on a more successful shopping trip. The village was in the middle of its scarecrow festival – the Crowet and Chandon display being particularly cringeworthy. Wrenbury was also equipped with a Robinson’s pub, the Dusty Miller, just by an electrically operated lift bridge. Three pints were purchased, these being followed extremely quickly by another three. Grindley Brook was the next point of interest. 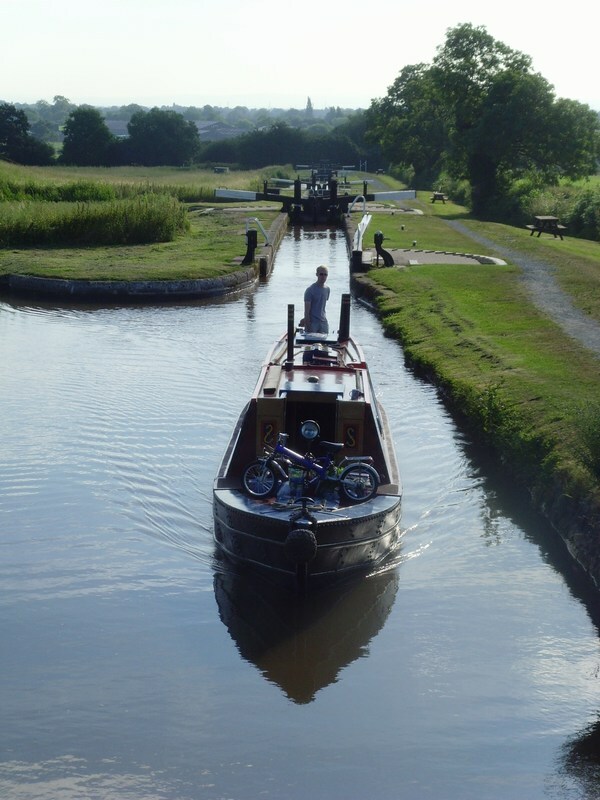 the first three locks were ascended with ease with boats coming towards us leaving them ready. The staircase was another matter. The lock-keeper revealed that in the spell between 11am when we got there (4ish) there had only been one other boat ascending the staircase. Boats coming down seemed almost continuous. As a result we had to wait for five boats to come down before we could start our journey up. 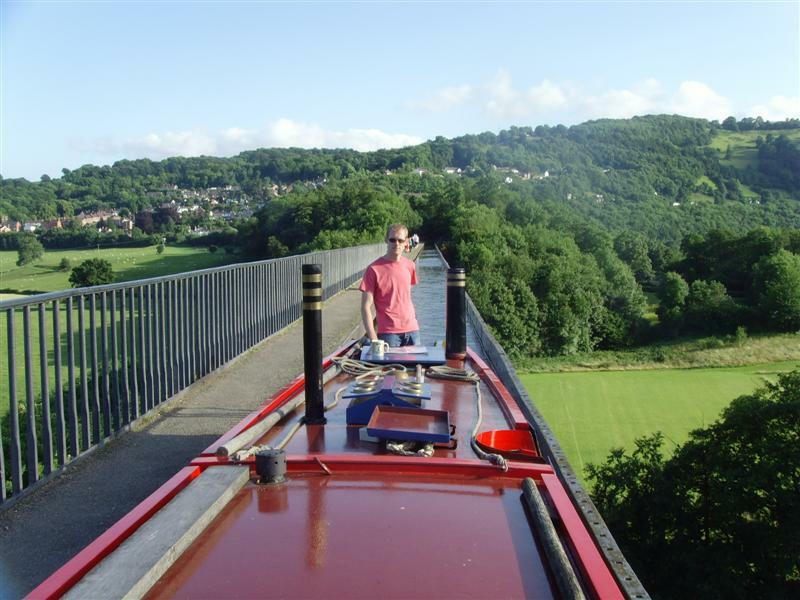 Fortunately we got to the top just before BW dewatered the top lock to retrieve a broken paddle. After Grindley Brook we crossed Whixall Moss. A useful shop (not mentioned in Nicholson) was visited, mostly to replace the rice that Luke had used up a few days before. While Bernard and Michael were there they enjoyed a sample from a bottle of elderflower and lemon cordial that had exploded while Bernard was waiting. The shopkeeper suggested this had recently been happening quite frequently. We are now moored at Bettisfield. 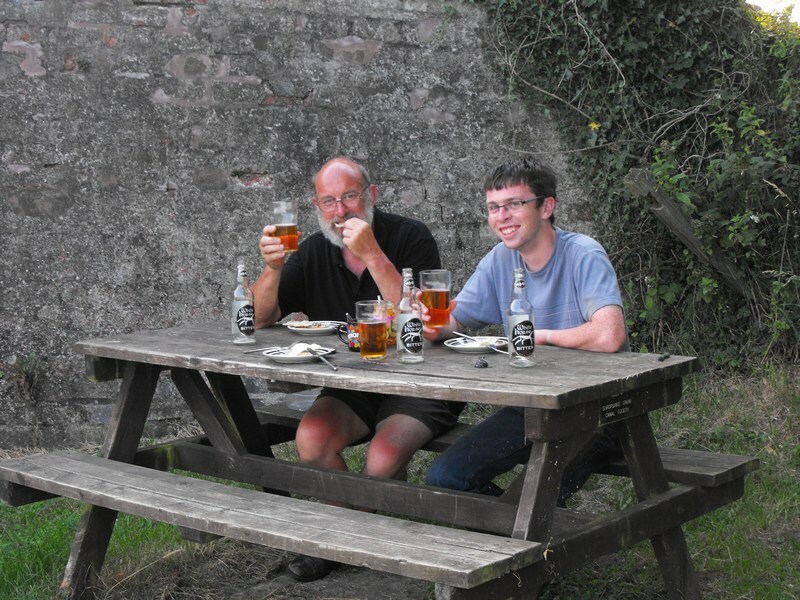 A conveniently placed picnic bench provided by the Shropshire Union Canal Society allowed us to eat al fresco rather than in the extremely warm front cabin. 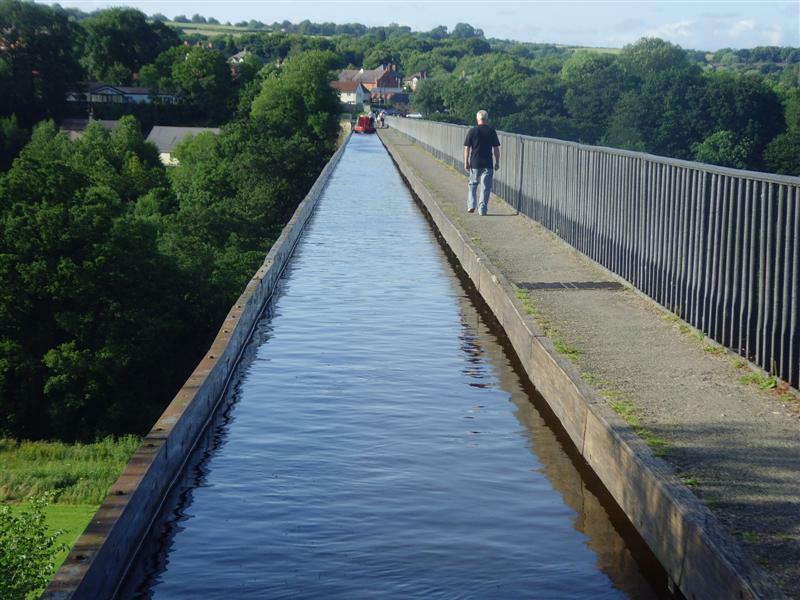 Tomorrow we move on further up the Llangollen canal and across the mighty Pontcysyllte aqueduct which has recently been awarded World Heritage status. Todays menus: back to assorted sandwiches for breakfast, gammon salad for lunch, lamb Jalfrezi curry served with poppadums (etc. ), rice, and White Horse beer for dinner. No cheese tonight.